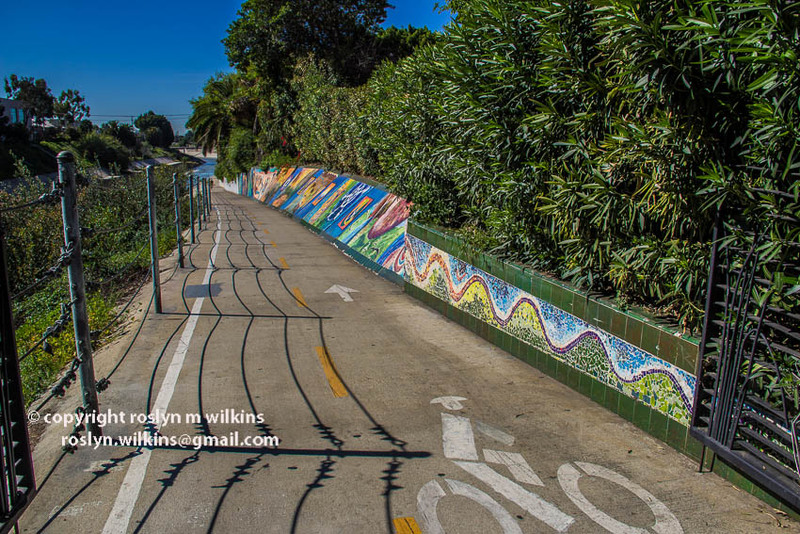 This mural is at the entrance to the Ballona Creek bikepath on Duquesne Avenue, Culver City, a couple of blocks from my house. It was originally spearheaded by Lori Escalara, who was the founder and first president of the Culver City Art Group. The mural represents the rivers of the Amazon, Ganges, Yangtze, Nile, Mississippi, Merced and Los Angeles. The public is invited to come and help with the restoration from April 16 – 20, 2015. You will be provided with brushes, paint, guidance… and snacks and drinks. Bring a hat, sunglasses and sun protection. Unfortunately, I have a prior commitment or I would be out there with a paint brush and taking photos of the progress. But I will take photos of the finished project and post them on this blog. In the meantime, these are the photos I took today so you can see what it looks like currently. It is partly painted and partly tiled. As it is installed on a gentle slope I have seen skateboarders out there doing their best to destroy it. Nothing is sacred to them. 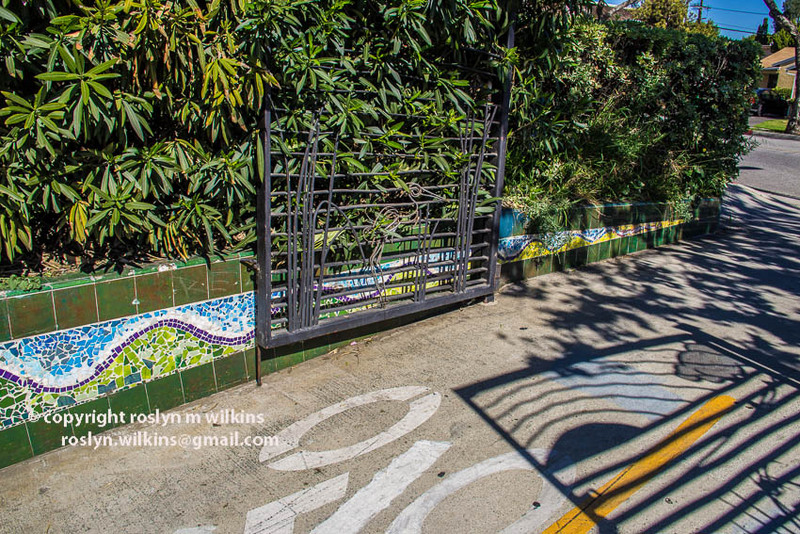 Entrance to the bike path with wrought iron designed by Brett Goldstone. A Los Angeles County Prop A Mural created in 1998 is in dire need of attention from the ravages of time. This group will be committed to the Mural’s renovation targeted for 2015 and seeks to support the community efforts towards the Mural’s improvement and future. The mural was originally created under the co sponsorship of Culver City and Ballona Creek Renaissance (BCR) 501c3 under a grant from L.A. County. It employed three artists Lori Escalera, Lucy Blake Elahi, David Fairrington and approximately 20 students. It involved a multitude of volunteers! 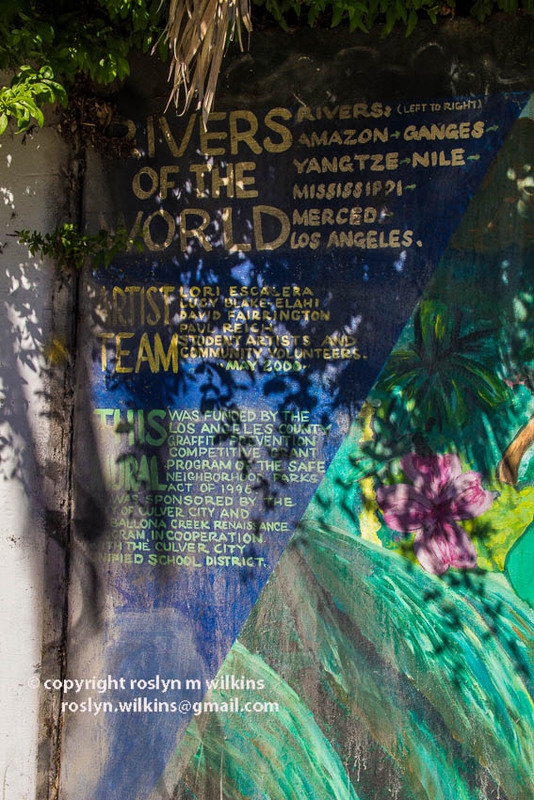 Rivers of the World” Mural (ROW) is located at Duquesne on the bike path access ramp to the north side of the Ballona Creek. In 1998, a competitive grant by Los Angeles County Proposition A fund final cycle was offered, and was applied for by Culver City at the request of Ballona Creek Renaissance (BCR) a 501C3 organization. 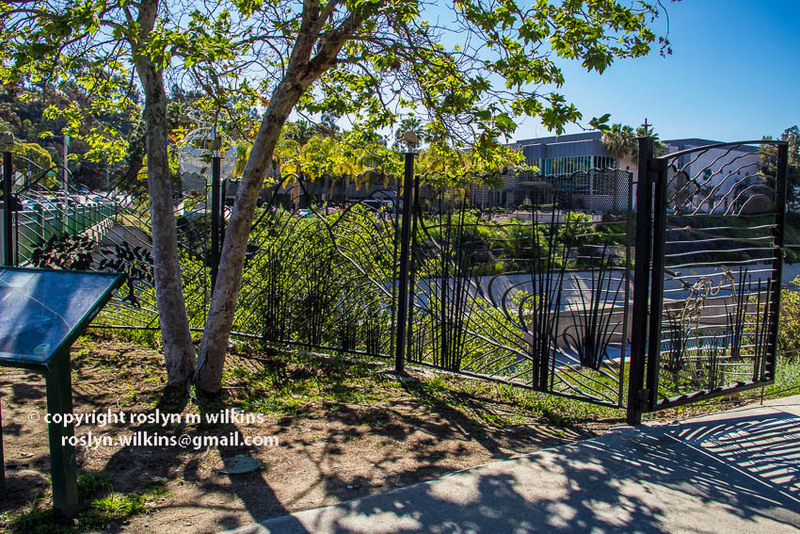 The project was implemented and directed by BCR, endorsed by the Culver City Unified School District and completed in 2000 by artists, employing 9 – 12th grade CPHS students, and the talents of community volunteers. The acrylic and tile painted mural consists 214 linear feet of ceramic mosaic, painted tiles, and acrylic paint. There is 700 square feet of paint and 700 square feet of hand-painted glazed ceramic. Approximately thirty youth taken from Culver Park Alternative High School, of middle school and high school age participated on the nine-month project. As part of the process the artists went into the classroom to mentor a vocational mural project experience. This means the students were engaged in the design, production, development and completion phases of the project. They learned how to draw thumbnail designs, grid mural layout from paper to wall, hand paint, glaze and fire tiles, hand-make and apply custom mosaic, used professional quality products and met stringent obligations as “employees” of the project. The students were paid for their work at the wall. Not only did they paint, they installed tile alongside professional contractors! 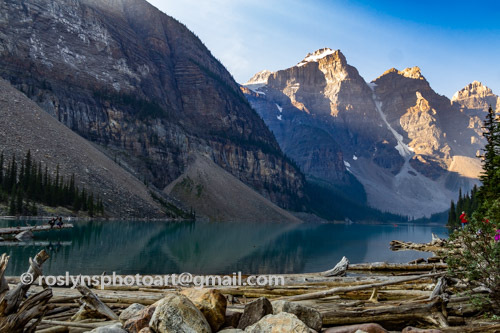 Categories: Art, Culver City, Events, Los Angeles, Neighborhoods, Outdoors, Photography, Southern California | Tags: Amazon, ceramic tiles, Ganges, Lori Escalara, Lucy Blake-Elahi, Merced, Mississippi, mural, Nile, rivers, Rivers of the World, Yangtze | Permalink.